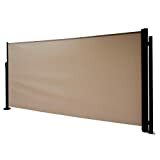 The folding screen can be used as an instant stable wall outside. This side awning can prevent common wind, low sunshade and provides sufficient privacy. Under some sunlight, it can replace umbrella…. Durable contemporary design looks great on patio….